Internationally acclaimed award -winning Sri Lankan Dr.Tanya Ekanayaka’s second solo album will be released worldwide by Naxos Records on September 14th 2018. 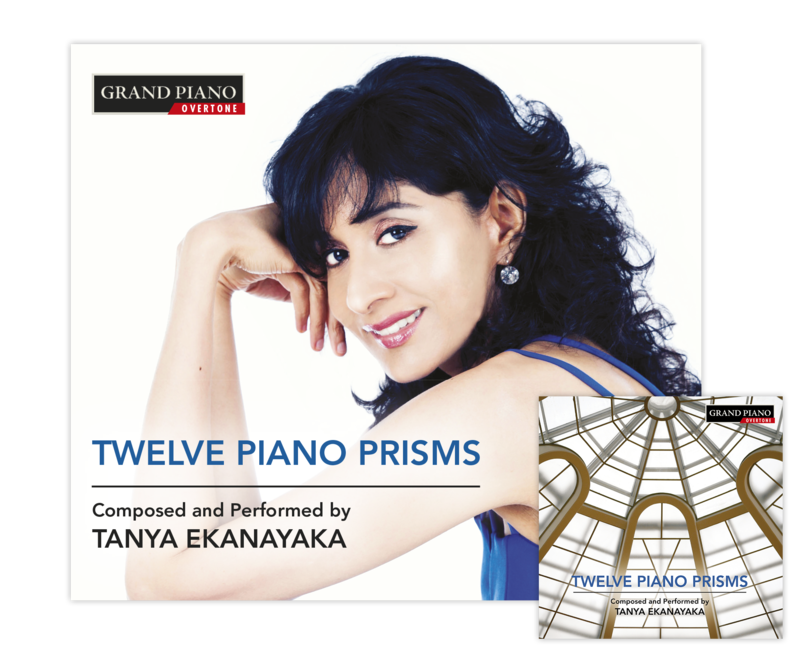 The album titled “Twelve Piano Prisms” comprises 12 new works for solo piano which evolved in 2016 and 2017.Dr.Tanya Ekanayaka herself performs the works/prisms in the album recorded by Roderick Buchanan-Dunlop and produced by Tanya for Naxos. Regarded as one of Sri Lanka’s finest artistes, Dr.Tanya Ekanayaka is classically trained with a background in Asian and Popular music. The British concert composer- pianist is also a linguist, musicologist and record producer. Although she trained as a pianist, her compositional skills are the result of a purely intuitive and natural development. Dr. Tanya Ekanayaka’s Twelve Piano Prisms extend the concept heard on her debut album Reinventions: Rhapsodies for Piano . They correspond to the twelve primary notes of the keyboard, and combine Sri Lankan melodies with music from other countries in a deeply personal representation of diverse cultures; their style inspired not only by a rich heritage of Western classical and indigenous world music, but also by pop, rock and film music. According to Tanya the new album in an overall manner extends the concept she introduced in her first album. Collectively, they explore two concepts. The first is an extension of the concept introduced on her debut album,” Reinventions: Rhapsodies for Piano”, where each work contained adaptations of indigenous Sri Lankan folk and traditional melodies. The first album contained, among other melodies, adaptations of ten of the eighteen Sri Lankan vannams. Vannams are an ancient set of dances imbued with a rich percussive character dating back to the 16th and 17th centuries, which developed in the courts of kings. Vannams are secular in character and most depict specific animal movements. The word ‘vannam’ is descended from the Sanskrit ‘varnam’, which translates as ‘descriptive praise’. Dr.Tanya Ekanayaka says that her new album contains adaptations of the remaining eight vannams, as well as transcreations of several other Sri Lankan folk and indigenous melodies. “Some of the works also contain adaptions of traditional and ancient melodies of other countries in which I have performed or with which I have been associated musically. In some instances, I have combined adaptations of a section of a Sri Lankan melody with adaptations of sections of a melody belonging to another country to form a new blend. The effort has been to create an organic union rooted in the present ‘moment’, and yet formed through the adaptation and conflation of melodies stemming from diverse socio-cultural and historical spheres. The countries represented in addition to Sri Lanka include Armenia, Japan, China, the United Kingdom and the United States. The adapted melodies are simply a deeply personal re-presentation of, and tribute to, their original forms and their attendant cultures and people”. The second dimension of this album according to Tanya relates to the relationship between the works. They are completely organic and independent. However, it is equally possible to link any or all of the twelve works in any combination with connecting improvisatory motifs to form new ones. This owes to certain features which are shared between the works. Not only do they each contain indigenous Sri Lankan melodies but certain motifs and techniques are at times referenced across them. Some of the Sri Lankan vannams also share similar melodic patterns which further enhance the connectivity. Tanya Ekanayaka’s compositions represent novel and invigorating musical genres involving reinventions of Sri Lankan melodies belonging to a wide range of ancient, folk and popular music traditions and more recently, adaptations of traditional melodies of other countries with which she has been associated musically. Her compositions which she describes as ‘deeply autobiographical’ are influenced by her multifaceted background, multilingualism, ambidexterity and partial colour synaesthesia. Her works have been featured on numerous international media and are often the first by any Sri Lankan composer to be performed at international venues. Tanya made her debut public recital appearance at the age of twelve, performed her first concerto at sixteen with the Symphony Orchestra of Sri Lanka (SOSL), as joint winner and youngest competitor of the SOSL biennial concerto competition, and has since performed in notable international concert venues in Europe, North America and Asia. Consistent with her interdisciplinary background, she holds a doctorate for interdisciplinary research involving Linguistics and Musicology from The University of Edinburgh as well as advanced academic and professional qualifications in Music Performance, Linguistics and Literature. She has been on the part time teaching faculty of Edinburgh University since 2007 where she has taught in its faculties of Linguistics and Music. « Mahinda Rajapaksa Says He Could Contest Presidential Elections Despite 19th Amendment and Then Fight it out in Courts But Has Not Decided Whether to Take That Risk in Interview with “The Hindu”.